Every family has their Christmas traditions don’t they? We certainly do and since having children of course these have evolved somewhat and I guess they will continue to do so as the girls grow. For now though there is one tradition that is a must in our house, and possibly every other in the country too. A visit to Father Christmas. Although we do love a tradition, we also love to try something new, to experience as much as we can in life and given the chance we will always choose something a little bit different. I mean the world is so full of wonder and things to experience why not try it all, or at least as much as you can in a lifetime. 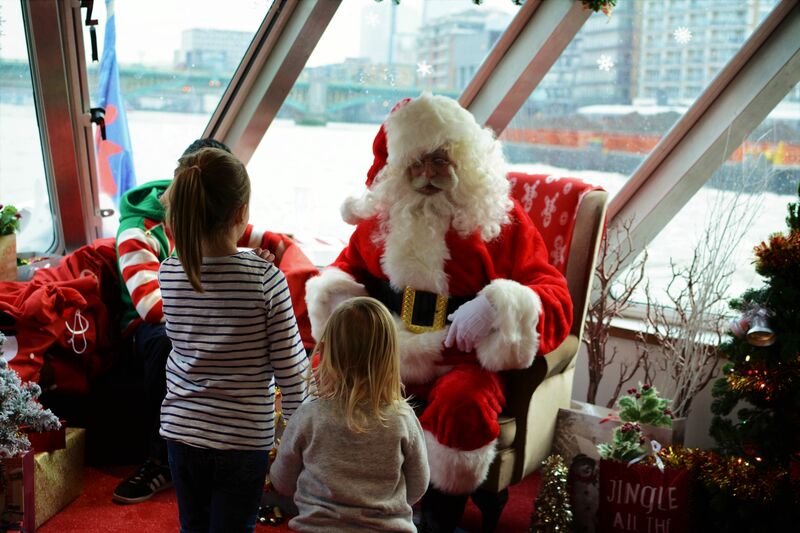 So when City Cruises invited us to ‘Sail with Santa’ we were over the moon. A tradition and a new experience all rolled into one, perfection. 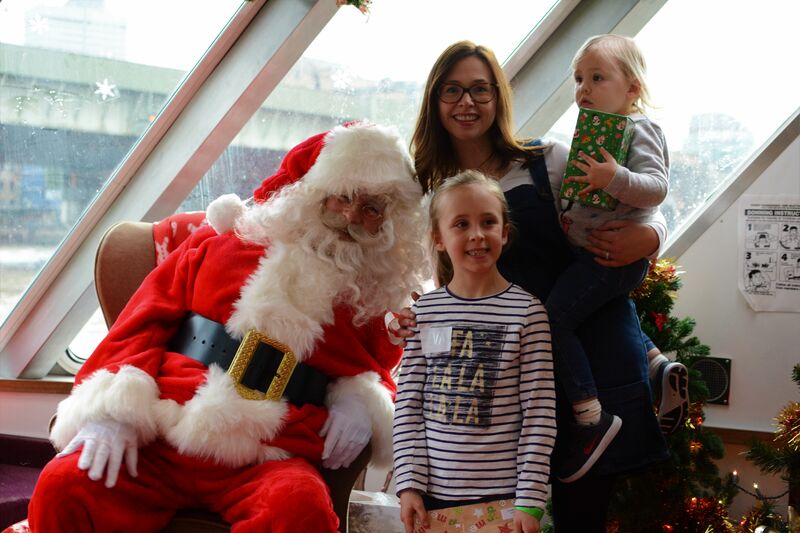 In the almost 7 years of being parents we have visited Santa in numerous places, a simple line up of children and their parents, some nervous and hiding behind legs and some pulling at the big mans beard and asking 100 questions. We have visited shows and winter wonderlands where the visit to the man in red is just a part of the journey, where elves and fake snow are aplenty and the festive spirit is audible. 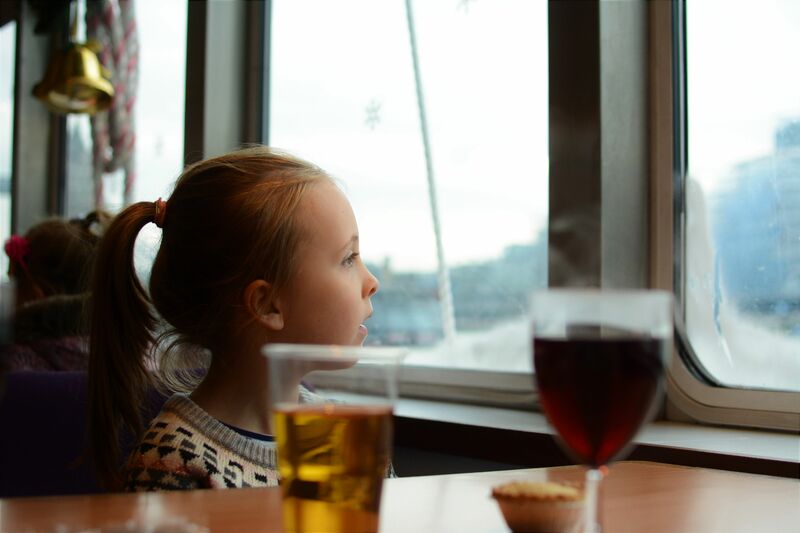 I wouldn’t say we have been to them all (I mean we have yet to go to Lapland…next year maybe!) But I would say we have had our fair share of Santa experiences. Never though, have I heard of sailing with Santa! How amazingly unique. 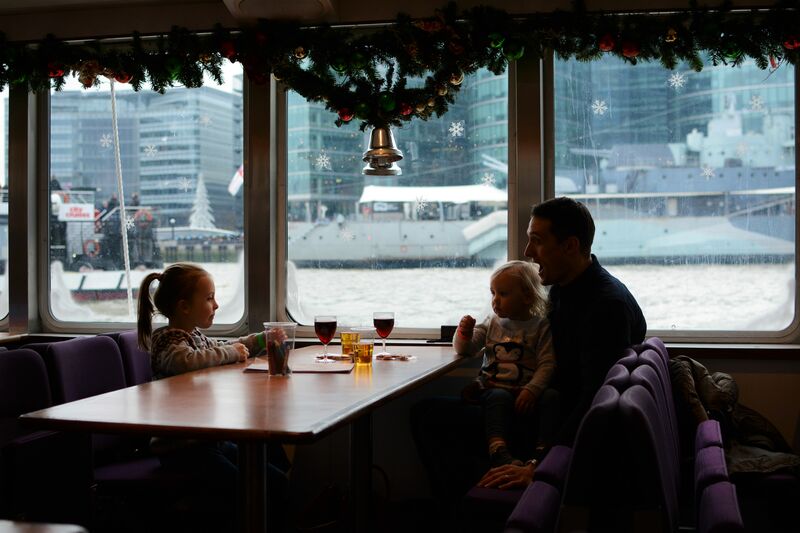 We arrived at Tower Pier in London on Saturday and although we had told the children we were visiting Father Christmas in London, and woke them up at 6am to catch the train which was exciting for them in itself, croissants on a train, what is not to love about that. I digress. 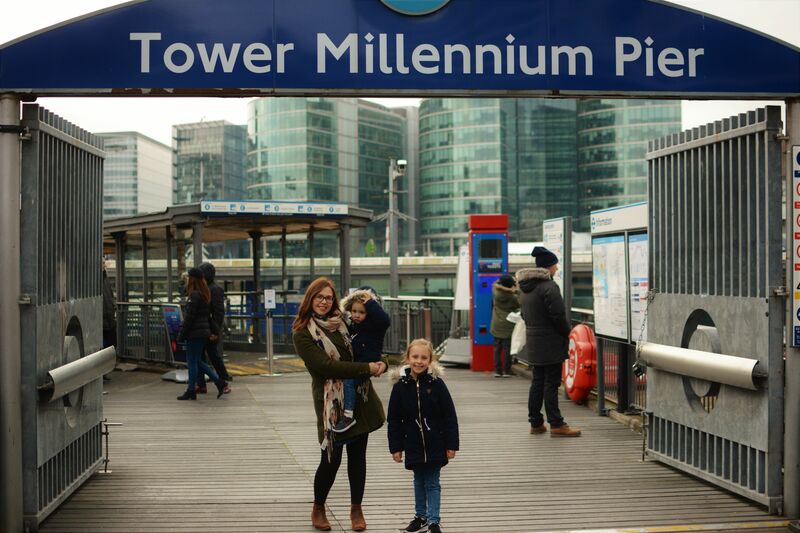 We actually waited until the moment we arrived at the pier to tell them that we were in fact going to take a river cruise on the Thames with him too. They were in awe and really excited, well I say they, Eva was excited. Roma could not look less enthused if she tried, she’s a slow burner that one! As we approached the boat we were greeted by extremely friendly staff and the children were issued with a wrist band colour coded to an age bracket and a name sticker. The guy, who donned a festive hat, even demonstrated his lovely singing voice with a Christmas song as we waited to board. 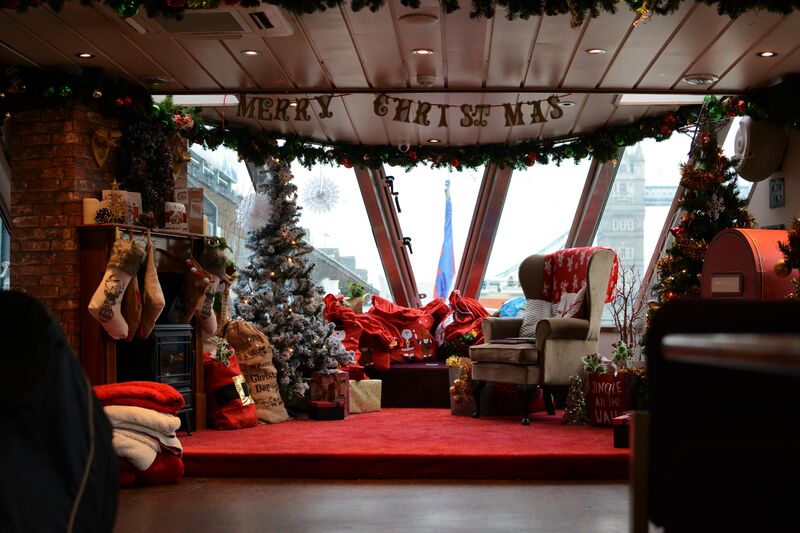 Inside the boat was so festive, the whole front had been transformed into what looked just like it could be Santa’s lounge, complete with a post box! The staff handed out mince pies and mulled wine for the adults and juice and a gingerbread man for the children all whilst chatting away to everyone and looking rather fetchingly festive themselves. 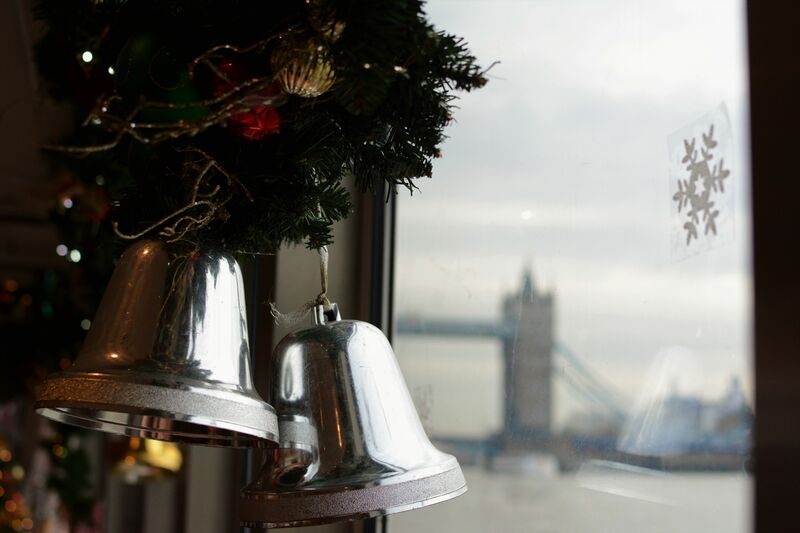 We set off from Tower Bridge on our hour long return trip whilst the children happily coloured in the letters that had been given to them and Christmas music played in the background. It was probably the first time I had felt properly festive this year. 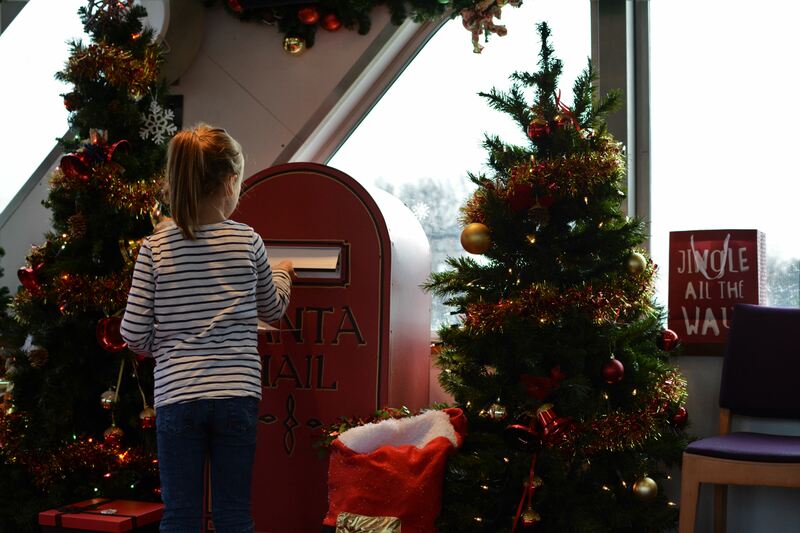 They were encouraged to write a letter to Santa and post it in the ‘santa mail’ box. Eva, having just written hers a few days before, had to make it clear that she had asked for the Christmasaurus and a necklace previously. You know, just in case two arrived on Christmas morning and it might confuse the elves. Gosh I love that girl. 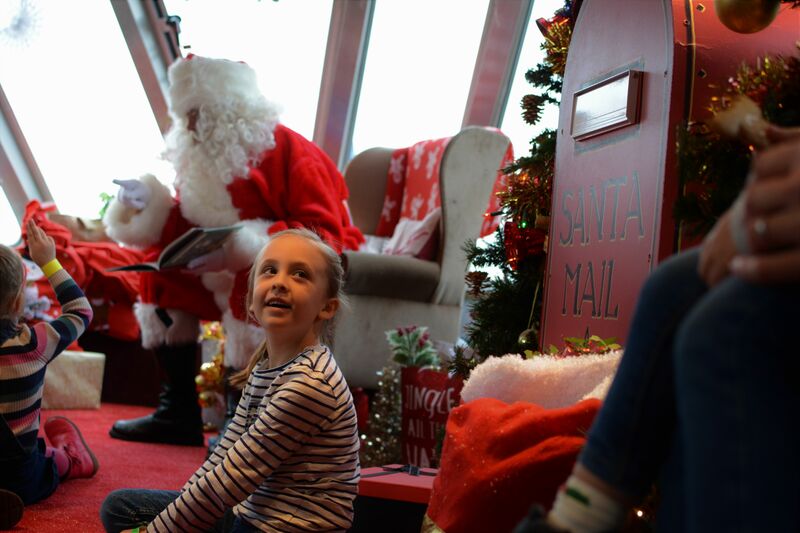 All the children gathered at the front as Santa appeared from the back of the boat, they even put down soft red blankets for them all to sit on, it was super cute. Not only did Santa then chat to them individually by name but sat and read a story too. Twas the night before Christmas. I love that book and we always read it on Christmas eve before bed so it was basically like getting a warm Christmas hug to hear it and see the children’s face of wonder. I do hope my version doesn’t pale into insignificance now! Excited faces then jumped up to join the line once the story was over to see Santa and receive a gift, he considerately took his time and talked to each child with real care and detail. Roma was initially a bit shy but once she held her little fingers firmly in her sisters hand and watched intently as Eva talked confidently to him, she heard his soft friendly voice and suddenly the words just flowed out. She would like a bell for her balance bike please, and that is all this two year old needs! What followed for me was the best bit, for adults that is. 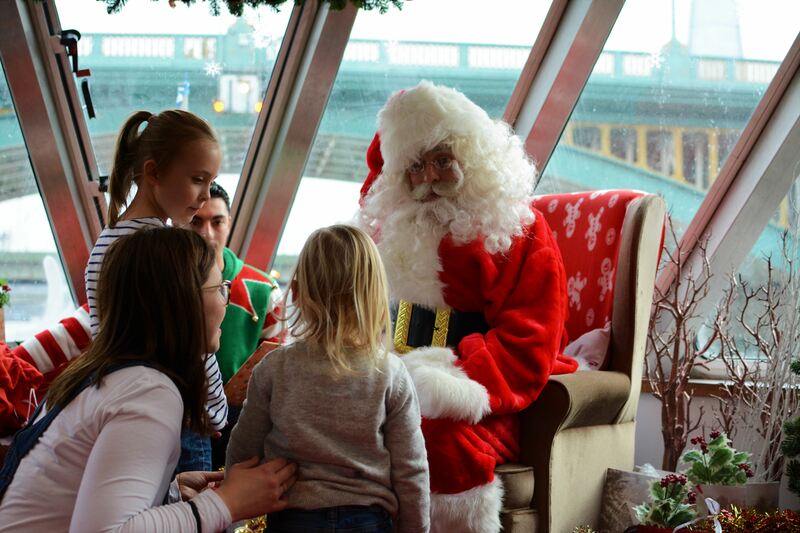 Everyone waved goodbye to Santa and we sat together as a family to enjoy the sights, the river cruise and each others company. So often at this time of year, and in life, we are all so busy with the moment, making sure the children are occupied and enjoying themselves or onto the next thing that it is hard to find the time to sit back and appreciate it. Yet here there was no choice, the boat was sailing for it’s hour long trip and as the Christmas music played there was a real buzz about the boat. 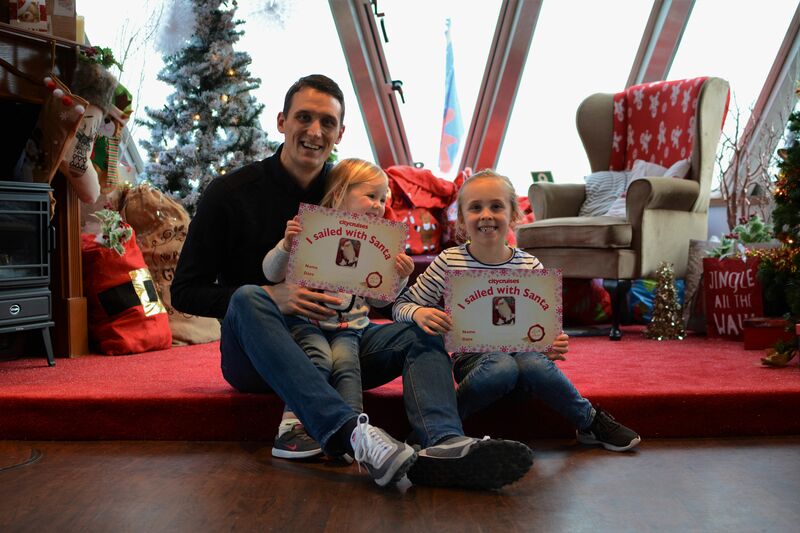 The staff came around to give out ‘I sailed with Santa’ certificates, chat to everyone and it was amazing to be able to properly sit back and enjoy it. We talked about the London eye we were going to go on later, the houses by the Thames that we would love to take a look inside and how the water was splashing up the side of the windows. It is that very moment that will stick in my head, that feeling of contentment and as the children finished their colouring and played with their gift from Santa (an activity book for Eva and a soft toy snowman for Roma that she has slept with every night since) I felt myself all emotional. This, after all, is what Christmas is all about, experiencing the magic and taking time to sit back and see it with your own eyes. 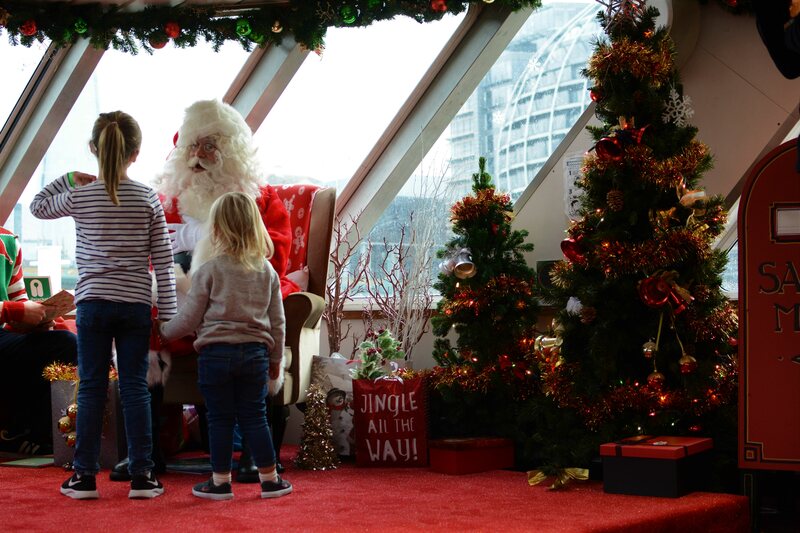 For that reason, if not all of the rest, I think at £28 an adult and £16 a child (under 2’s free) it was great value for money and that little something special for all ages at this time of the year. 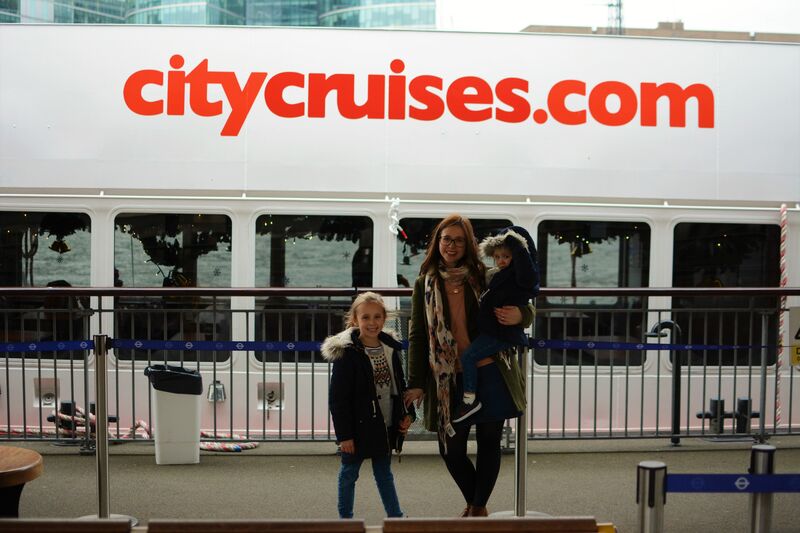 **Thank you City Cruises for inviting us to Sail with Santa we had an amazing time. As usual all content created is my own. Wow this looks like such a different way of seeing Santa. I love it!